Wingeron Actuator This device is a compact wingeron and pitcheron actuator which can be adapted to use on a flying V-Tail stab. The parts used are a Graupner steel blade/brass housing, brass tubing to suit the wing rod and Du-Bro ball links. It works on the principal of an angled slot on a slider, which moves an actuating pin on the wing up and down. The angle of the slot is 30 degrees. 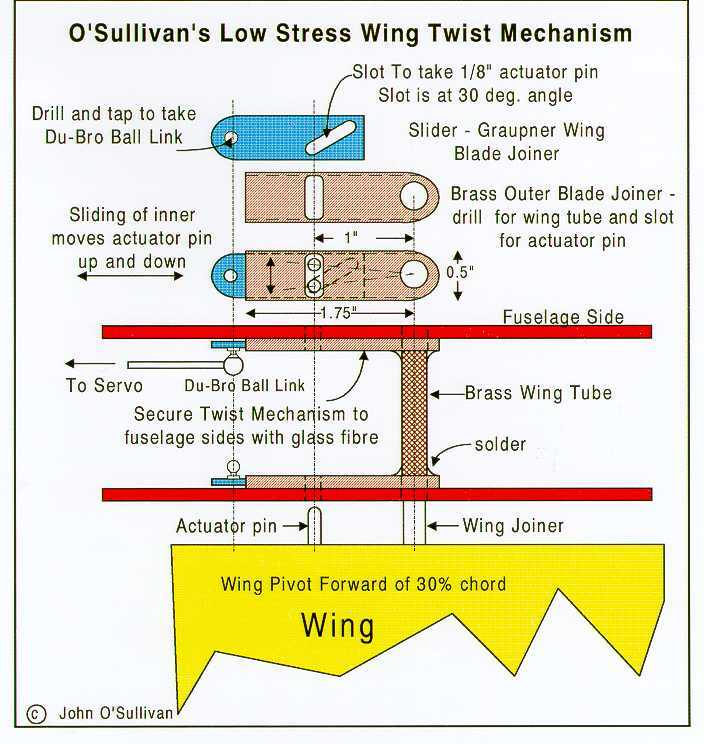 Twisting loads on the wing, caused by impact, or flight loads, are not transferred to the servos directly, as with a bellcrank. Instead the loads are transmitted as vertical loads on the slider, by the actuating pin. The angle that they hit the inclined slot, minimizes the resultant loads transferred to the slider and consequently, the servo. 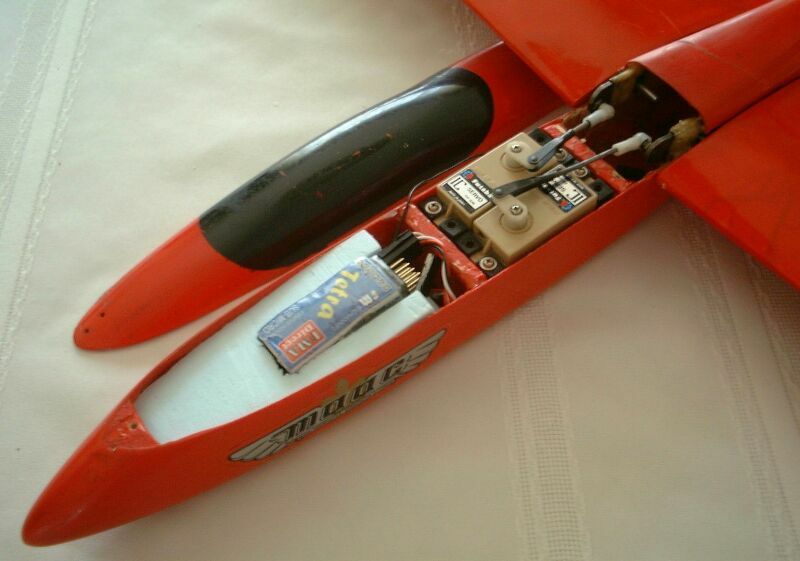 The unit is compact and attaches easily to the inner fuselage sides. The unit may be used with both sliders attached to one servo for wingeron control. For this the slots would have to be in opposite directions to get the correct aileron movement. Alternatively, they can be attached to two servos and the wingeron/pitcheron movements programmed in. The drawing above gives the general layout of the system. Measurements are not over-critical. The above layout is what I have been using. To get more angular movement, shorten the distance from the pivot rod to the actuator pin. The largest model I have used it on to date is a 96" thinned Eppler 374 model and it worked flawlessly. The photo below shows the installation in a 74", S7012 Minitwist Slope racer.